Yesterday afternoon my employer had to let me go due to a lack of work. After just over two years I find my self unemployed. So, if you need CAD work done, a white paper written, a CAD Standards Manual, training, or content for your blog (and you are able to provide renumeration) please feel free to contact me. I will consider full time employment, part time employment, contract or freelance work. I will take on one time projects. In the meantime, if you have immediate AutoCAD Training needs I can help out. I have two fantastic videos on using AutoCAD 2011: AutoCAD Fundamentals and Advanced AutoCAD Techniques. There is also a bundle package providing a great discount price for both titles. Check out my store page for details. If you like CAD related Shirts, hats, shoes, and even iPhone covers, check out my CAD Store. There are several items available and we will be expanding. All items are customizable to better fit your needs as well. Help shape the direction of AutoCAD and win (possibly) $30! Autodesk has released a survey asking about your AutoCAD drawing comparison needs. Take about 5 to 10 minutes to fill out this survey. Once completed your name will be dropped into a proverbial "hat". A winner will be selected in about 5 days time. Try it out. it only takes about 5 minutes and you could win $30 (USD.) Plus your answers will be used to help influence Autodesk! If you are new to AutoCAD WS Mobile, don't worry. Autodesk has provided a nice little tutorial on how to use it on your Android device. Anywhere Storage - Now you can connect your AutoCAD WS web and mobile account to a variety of storage sites. 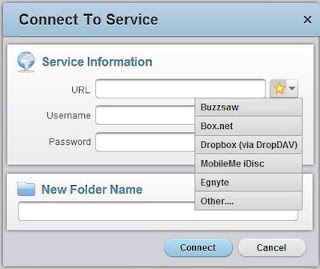 Click on the following tutorials to learn how to connect to: Buzzsaw, Box.net, Dropbox (via DropDAV),MobileMe, Egnyte and even your own Fille server or SharePoint site. Plot-to-PDF/DWFx -- You can now create PDF or DWFx files from your DWG files for plotting or sharing with others. PDF Support -- You are now able to open markup and share a PDF in AutoCAD WS in the same way as a DWG file. AutoCAD WS already had the ability to save files in the cloud, its own cloud. This new "Anywhere Storage" functionality means that you will always have access to your files, even if you can't get to AutoCAD WS, or if you loose connection to the internet. Log in to your AutoCAD WS account and open the Drawings Tab (it's on the left side of the screen.) Click the CONNECT button. This opens the "Connect to Service" window. Click the down arrow icon next to the URL field to populate a list of typical cloud based systems. Pick the service you plan on using (Buzzsaw, Box.net, Dropbox, and more) and fill out your username/password, etc. If you are going to use Dropbox with AutoCAD WS, you will need to set up an account with DropDAV. Once you've done that you can use Dropbox. 3Dconnexion has just released a new driver for its line of 3D Mice. According to their press release and website, this new driver will let users use their 3D Mouse ( SpaceNavigator, SpaceNavigator for Notebooks, SpaceExplorer USB and SpacePilot PRO) with any application they are running! That's an interesting concept. I downloaded the driver (108 mb) for Windows 64 bit and installed it on my Windows 7 laptop. That was easy and painless. I plugged my Navigator and later my Space Pilot PRO into my laptop and started opening programs. 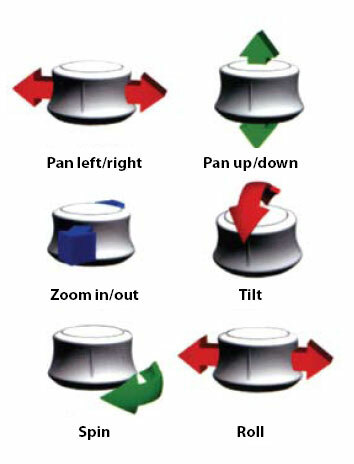 The left button could not be altered, but I can change the function of the right. Out of the box it acts like a left-click of the mouse (a regular mouse.) The Space Pilot Pro already had so much integration with it (RSS feeds on the display, Outlook Integration, etc) that at first it didn't seem like much, but it's there. In Chrome (and other browsers) I could scroll up and down web pages. It gave the scroll wheel on my non-3D mouse a break. In Adobe PDF Reader I could zoom in and out of my document and scroll through pages. The same thing with Microsoft Word 2010. So what does this mean? For most people not much. But for users it means that these 3D mice will (should) work out of the box with all applications. No need to wait for the driver. However, being able to use these 3D mice with "everything" is not that big of a deal. It's not because it doesn't add much more functionality to the programs. But if you already have one then use it. If you were concerned about getting one (face it they aren't cheap) because you weren't sure if they would work with your program or maybe you wanted more bang for your buck, then now, maybe you don't have to worry about it. There are drivers for Mac OS, 32 bit Windows, 63 bit Windows, Siemens (3DxMagellanProxy), and a few others. I didn't see any Linux support. These drivers are still in Beta and are not officially supported. If you have any issues with them, well, use them at your own risk, they are beta.